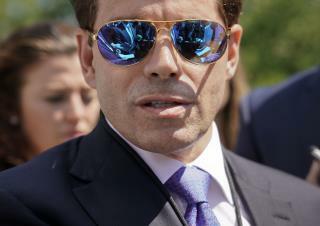 Anthony Scaramucci: Where to begin? Try here, here, and here. Chris Christie: The former head of Donald Trump's transition team has the lowest approval rating of any governor in New Jersey's history. James Comey: The former FBI director lasted not even five months under Trump. Mark Fields: The Ford CEO was canned after shares fell almost 40% during his tenure. Tiger Woods: Blame his DUI arrest and 899th ranking in men's pro golf. Kendall Jenner: Remember that Pepsi commercial? Montgomery Moran: After a wave of issues at Chipotle, the co-CEO stepped down last year. Tomi Lahren: The conservative media personality was suspended from the Blaze after announcing she was pro-choice. Park Geun-hye: The former president of South Korea was impeached and jailed after a corruption scandal involving Samsung. Mitch McConnell: As Senate majority leader, McConnell failed to repeal and replace the Affordable Care Act. Hillary's mummified uterus was only number 11. She is even a loser on the biggest loser list.